I first wrote about coffee flour for my Bakers Journal column in December 2014. The article had a focus for small bakeries and cafés using coffee flour for some niche items. There seems to be continued consumer interest in coffee flour as a gluten-free, nut-free alternative for baking and cooking. However, after a brief review of the availability and the price point, it is safe to say it’s in limited quantities and the price point is very high compared to other gluten-free, nut-free flours. As part of my business, I’m always researching trends and sharing the information with my clients and community. Let’s explore what coffee flour is, the potential nutrition benefits and how people are using it in this Grow with Nutrition post. This is the format I wrote about in my Bakers Journal column. Coffee production generates a by-product called cherry pulp. A company in Seattle, named CoffeeFlour has developed a process based on wet milling to harvest the goodness from the cherry pulp into coffee flour. They are working with coffee growers around the world and are selling the coffee flour directly to food companies, bakeries and restaurants. The other trending way of making coffee flour is from the actual coffee bean and not the by-product cherry pulp. It is created through the process of parboiling raw coffee beans at 300oF (150°C) instead of the usual 400oF (200°C) that is normally used to roast coffee beans to make coffee (1). The parboiled coffee beans are then milled into flour. Therefore, technically these are two different parts of the coffee plant with unique compositions, chemical and nutritional profiles. There is insufficient scientific literature on the health benefits of either form of coffee flour. However, let’s explore the potential nutrition benefits. Coffee grows as a fruit plant and the coffee bean is essentially the centre seed of the cherry blossom (or pulp). 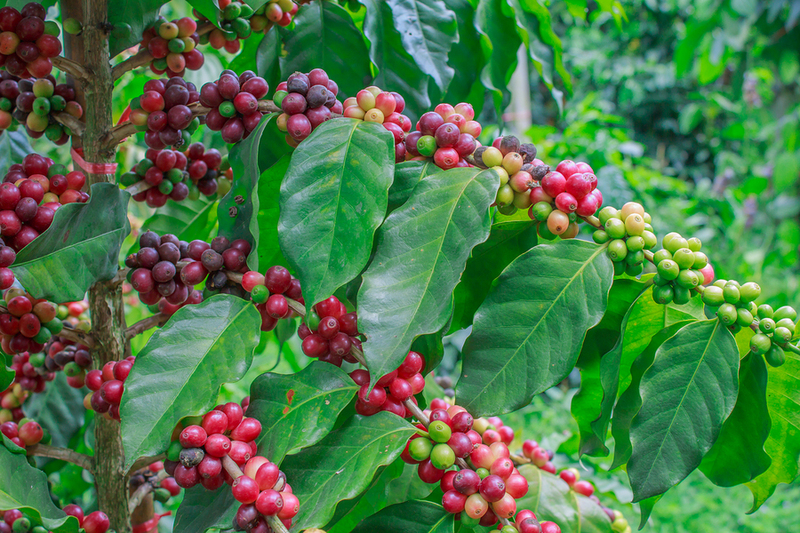 The fleshy, nutritious cherry blossom is the by-product, which along with being an effective fertilizer that has been used in coffee growing regions for years; this by-product has the potential for new food uses due to its high fibre and antioxidant levels. The hypothesis is that because raw coffee beans (centre seed of the plant) have a substantial amount of the antioxidant chlorogenic acid (CGA) and caffeine, both will be in concentrated amounts in the flour (1). CGA is a well known antioxidant and been touted as being able to reduce blood sugar levels and potentially exert an anti-diabetic effect. It has also been implicated in weight loss and exerting an anti-obesity effect, but that is insofar correlation and not necessarily due to chlorogenic acid (2). Numerous research studies have shown caffeine can increase mental alertness; which intern has brain health benefits. How is Coffee Flour Used? This is such a new product; it is in limited access to the general public. However, moving forward, both types of flour will have similar uses, yet, they will provide different flavours and colours. The cherry pulp format has sweet tart fruit flavour and not a typical coffee flavour. It will darken the final product slightly. It can be used as shelf stabilizer, fibre enrichment, and a structure builder for baked goods and breads. The raw coffee bean format will have more of a coffee flavour and a neutral colour. It can be used in both baking and cooking, especially for people requiring gluten-free and nut-free. Both of these coffee flours are in their infancy. Overall, both formats have limited, robust scientific evidence for the health benefits to humans. Specifically, it is not known the dosage levels and frequency of consumption that will promote the touted health benefits. It will be interesting to see how coffee flour emerges in the marketplace and the results of well designed scientific clinical trials to confirm and conclude the health impact.